Wing Blast is it you? This will be certainly played in Academic Espionage rogue archetype. Pretty solid removal with easy to full fill restriction. I'm quite sure we will see that card, as thief/burgler rogue is fun to play. Even if won't be competitive archetype it still might be one of the best/fun decks to play. Slightly meme yet still giving you some decent chances of winning games. 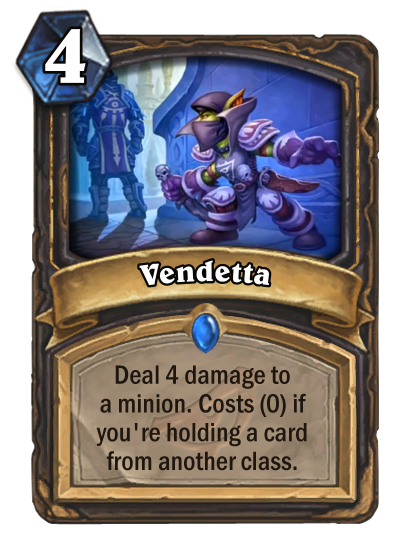 Thanks to lately revealed Hench-Clan Burglar vendetta will be 0 mana even in mirror match up. Useful, not in mirrors unless the reveal more cards that gives you cards from "another class" instead of "your opponent's class"
Seems really easy to pull off with Tess Greymane rogue. Covers for the deck's weakness in dealing with tempo / aggro. Should be a very good include. Insane tool for Burgle rogue, other rogues could even decide to add a small burgle package just to play this card! A solid card in Academic espionage rogue. A very solid one (except in mirrors). Burge rogue already wants to play auctioneer, zo a zero mana deal 4 will see play for. sure. An 8/10 weapon, 9X Leeroy Jenkins, 9 Zilliaxes, or going infinite. You decide. Might make it worth splashing Blink Fox. Very strong, great tempo, great with Auctioneer and for combos. Good design. Feels like the essence or Rogue. So this is the first damaging spell for rogue which does require a unit to be at full health? Now all those garbage-generated spells will have a purpose!